Stay in this luxurious 2-bedroom, 2-bathroom, open concept condo that is located on the popular northern tip of the island. 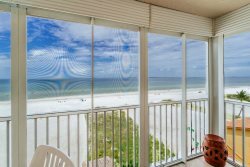 From the picturesque views of the Gulf waters and beach to the tasteful decor, every detail in Estero Island Beach Villas #603 will capture your attention! The fully equipped kitchen has every amenity needed for an extended stay or a short getaway! A king size bed is located in the master bedroom, while twin bunk beds and a queen bed furnish the guest bedroom, and a queen sleeper sofa in the living area, allowing this unit to accommodate up to 8 people. This condo also includes an in-unit washer and dryer, as well as covered parking to insure a hassle-free stay! This sixth level living condo has everything you need and more!